Autumn and I took our niece and nephew on a weekend trip to the Sequoia National Park to explore the giant sequoia groves. We arrived at the park entrance in the town of Three Rivers on the afternoon of Saturday. We made sandwiches for lunch, freshened up our drinks and checked into our hotel room. After unloading our unnecessary items and our nephew Gabriel’s jacket, which he would later regret, we drove into the park. It takes a good 2 hours to get to where the groves are in the park from the entrance at Three Rivers because sequoia’s grow at 5,000-8,000 ft elevation and Three Rivers has an elevation of only 843 ft. Once at the right elevation we hiked through the first grove Big Trees Trail, which houses the 257 ft Sentinel Tree. I’ll do another post on the beauty of this grove later. Since we made a few stops on the way up, everyone was already getting hungry for dinner and we decided to head back down for a cooked meal and not a packed meal. Autumn and I always have at least one dinner at the Pizza Factory on our trip up there and that is what the group voted on. 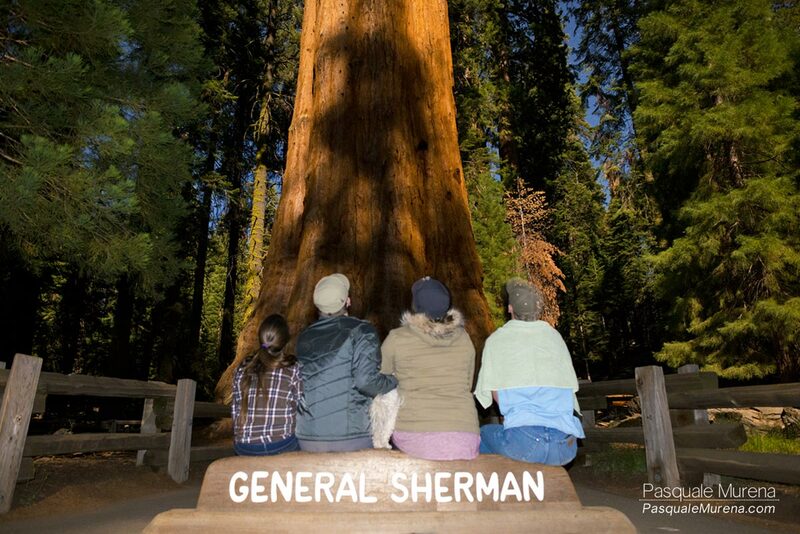 Afterwards, we gave the kids the option to go hang out in our hotel room or drive back in to see General Sherman at night. They chose the General. 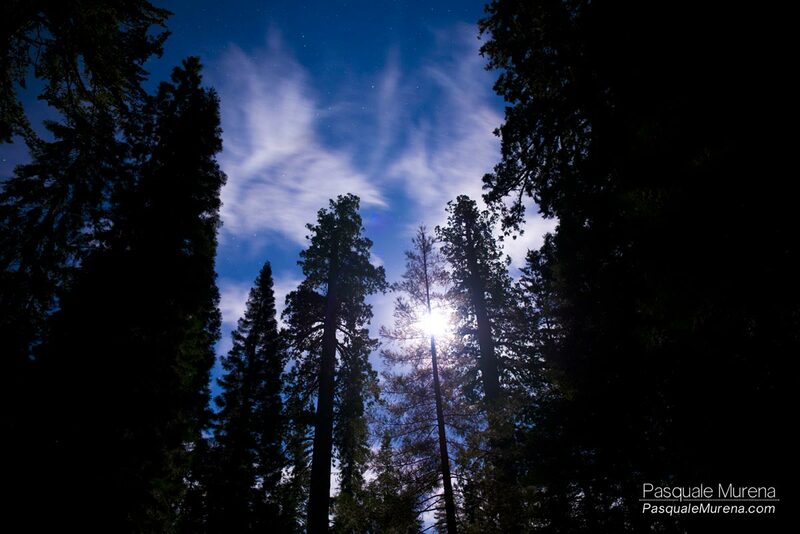 The moon breaks through the clouds and trees at night. We hiked into the grove with jackets, tripod, camera and a towel for Gabriel who now knows why we all left our jackets inside the car. There was no one else in sight and you couldn’t even hear the cars up on the road. I took some photos and everyone admired the General’s height and mass. 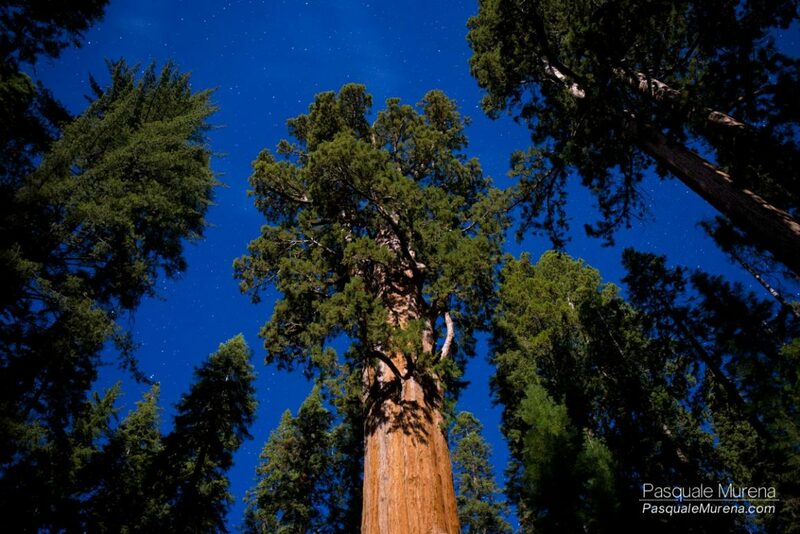 The General Sherman (which, is the photo on the top of this post) is the largest in the world at 52,508 cubic ft. The moon was almost at 100% full so that made photographing the tree almost look as if it was daytime and made it hard to see the Milky Way. One of the highlights from photographing the night was seeing the Big Dipper, it was very easy to spot and we had a perfect clearing to capture the entire constellation. Since it was so quiet, that we didn’t even hear an insect, and it wasn’t very cold we all laid down on the cement and watched the stars drape over the General-when we hear a crack then the crashing of a tree. Behind us a tree fell and we got to hear this once in a lifetime event as a family. We packed up my gear and we headed back to the car, I got every back in the hotel room at around 2:30. We all agreed that this was our favorite part of the trip and the best way to experience the grove, especially together. 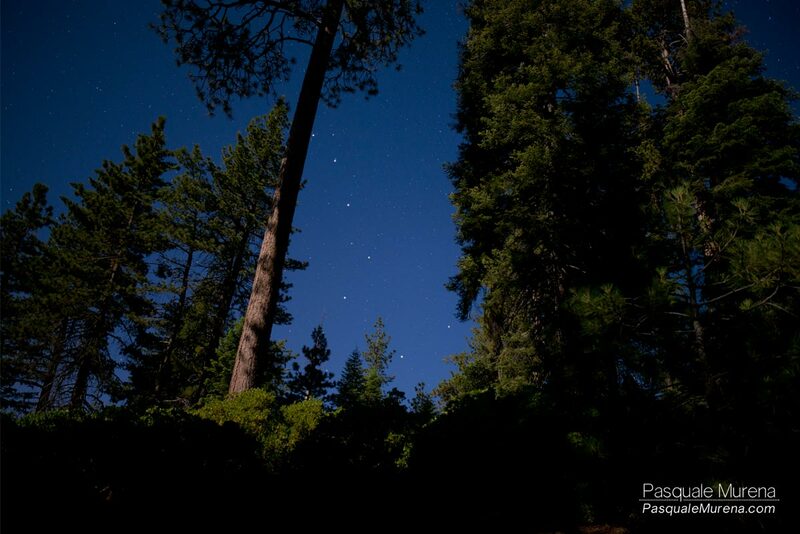 What amazing photos, to be out there at night surrounded by greatness is a blessed feeling.